1. What's the difference between Sidify and other Spotify converter tools? 6. Can I convert the entire playlist from Spotify? 7. How to automatically store the output audio into Artist / Album folders? 8. The output audio quality is unsatisfied, how to improve the output quality? 9. How to make Spotify Music Converter work faster under Spotify V1.0.87 or above on Mac? 10. How to solve the problem of "Conversion Failed" when converting Spotify music with Sidify? 11. How to fix no sound issue on Mac after using Sidify? 12. I encounter some problems that I can't find in FAQ. How can I get technical support? Sidify Music Converter for Spotify is the fastest Spotify to MP3 Converter on Mac which can convert Spotify music at fast speed than other DRM removal programs do. Furthermore, it can also keep ID3 tags and all metadata after converting. 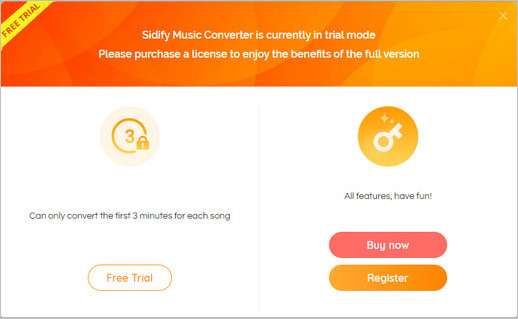 Run Sidify and click "Sidify Music Converter > Registration" on the upper left or directly click the "unregistered" icon from Sidify to register your program. Fill the blanks with your Email address and Code you have received from the email. Then click OK. Important Notes: since Sep. 22nd, 2016, Sidify Music Converter for Mac adopts a new registration mechanism in the latest version. 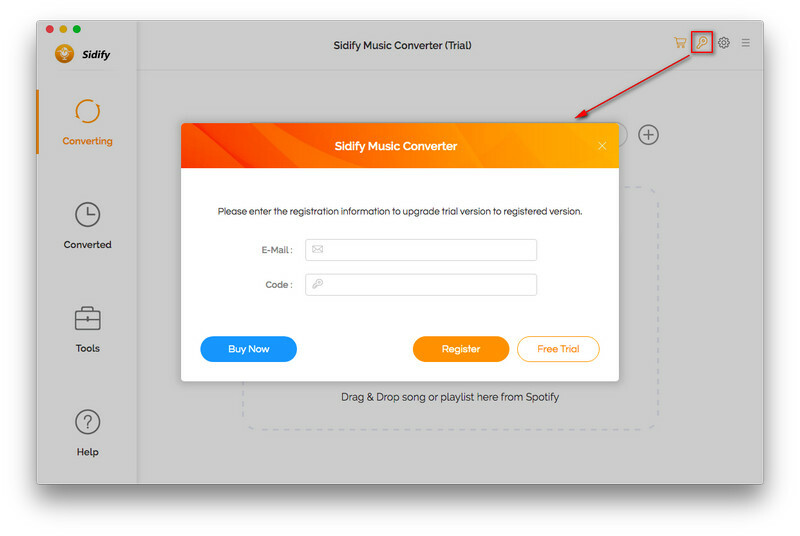 New users who purchased Sidify Music Converter for Spotify are required to register the program with Email address and registration code. For old users, it's still available to register with registration name and registration code. Now, Sidify Music Converter for Spotify is specially designed for converting Spotify song and Spotify playlist to MP3, AAC, WAV or FLAC format. Of course, you can. Sidify supports converting the entire playlist by dragging and dropping the playlist from Spotify to Sidify. Tips: If you want to convert a playlist with more than 200 songs, we suggest you should open the playlist on Spotify, select all files in the playlist and drag & drop them to Sidify program for converting. Or we suggest you'd better to create some new playlists and separately add them for converting. The latest version of Spotify Music Converter Mac allows users to convert Spotify music/playlists/podcasts at 5x speed under Spotify V1.0.87 or above. You can follow "How to Convert Spotify Music at 5x Speed under Spotify V1.0.87 or Above" to learn how to make Spotify Music Converter work faster on Mac. Please make sure your music can be well-played on your Spotify before converting. Please delete the driver file under "/Library/Audio/Plug-Ins/HAL/MJRecorderDevice.driver" (see this tutorial), then reboot your Mac and retry. Please check whether there is any external audio device connected with your computer including USB, Wi-Fi, Bluetooth and HDMI, etc. If it is, please disconnect them and retry. 11. How to fix no sound issue on Mac after using Sidify Music Converter? Please contact us at support@sidify.com, tell us which problem are your encountering and provide us with detailed info like Mac OS, Spotify version, and program log files for analysis. Tips: How to find the two log files of Sidify? Just find the menu button on the upper right corner and click on File > Show Log File, A window which contains the log files would pop up. They are Spotify.log and Application.log.